Hello, I'm in need of a little help. 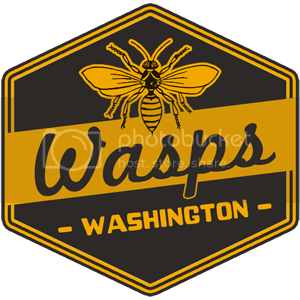 I need a logo for a team named the Washington Wasps. I tried my own hand but I just couldn't get what I was looking for. I'd like it to fit in the 1930-1950 era. 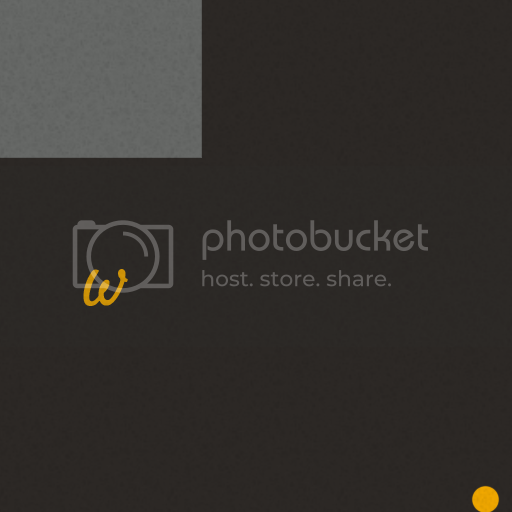 My plain yellow W just wasn't cutting, I was hoping someone could create a retro looking Wasp over a 'W'. Here is a Charlotte Hornets jersey that may work for you. I know that this isn't 100% what you are looking for however, it is very similar and fits your era very well. Holy crap knuckler I could kiss you. It's wonderful. Thank you. And thank you Bottom of the Sixth, those will make a delightful uniform. Edit: The look of it fits perfectly. 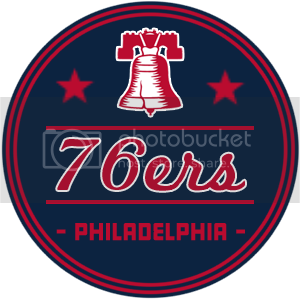 I normally hate pushing further requests, but do you think you could make one for a team named the Philadelphia 76ers. 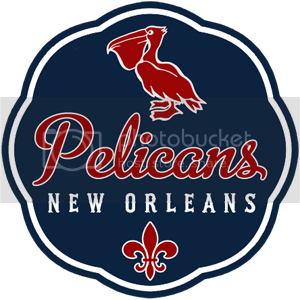 Most of the logos I've seen on various OOTP related sites is based on the far too modern look NBA logo. Last edited by Steve Sax Syndrome; 08-14-2012 at 09:50 PM. Reason: Rather shameful further request. I will give the 76ers a shot in the next day or so - you aren't putting me out. A bit of a rough draft. I am thinking that a star on each side of the bell might look nice. I'm open to ideas on making it better. Once again, wonderful. I'm quite fond of the bell, and I think the two stars would tie it together nicely. You've fit the time period I was looking for perfectly again. Glad to here I'm not putting you out, with work like this my league will have the best damn logos in town. Looks great, thanks for taking the time! I knew this forum wouldn't let me down. 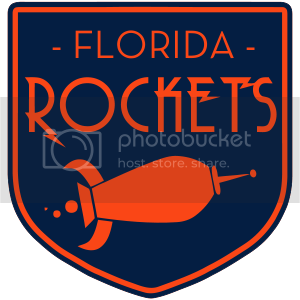 If you're up for more there's five teams in my league that could use your logos! No rush on any of these, just if you have some spare time. Last edited by Steve Sax Syndrome; 08-16-2012 at 03:52 AM. Reason: Shameless requests for more logos. Tsktsktsk. Slowly but surely, I will get to these over the next couple of days. Wow, they're both great, but that top one is the almost exactly what I was looking for. 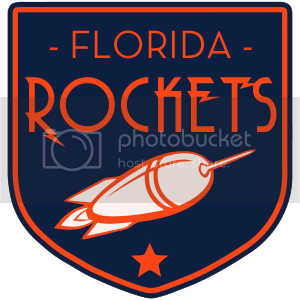 Love the design on the rocket. Love the star on the bottom. Great work again! I am going to try this in alternative colors since you already have the 76ers in red, white and blue. I think it looks better in the first scheme, but in case you want alternative colors, here it is in Mardi Gras colors. I can do it in any color scheme you want though. Just let me know if you need changes. Last edited by knuckler; 08-17-2012 at 02:00 AM. Wow logged in at the right time there... heh. The Fleur-de-lis is a very nice touch. I love the first color scheme. The second one looks exactly like what I imagine a New Orleans team would have. Both look great! DelMarVa Baseball League - 2037 WBC Tournament - Won by Team USA - New England. DelMarVa Baseball League - 2039 WBC Tournament - Won by Team USA - New England..
You are killing me Knuckler, with your logo work! You capture the feeling of the "older era" super well in your work! BTW, do you stay at a Holiday Inn Express every night? Thanks! 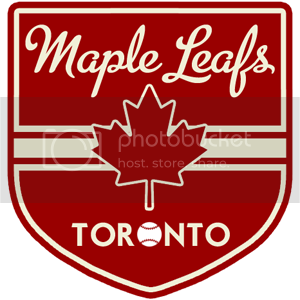 I like doing the older logos a lot better, so it's nice to hear that they are capturing the feel of the older eras.